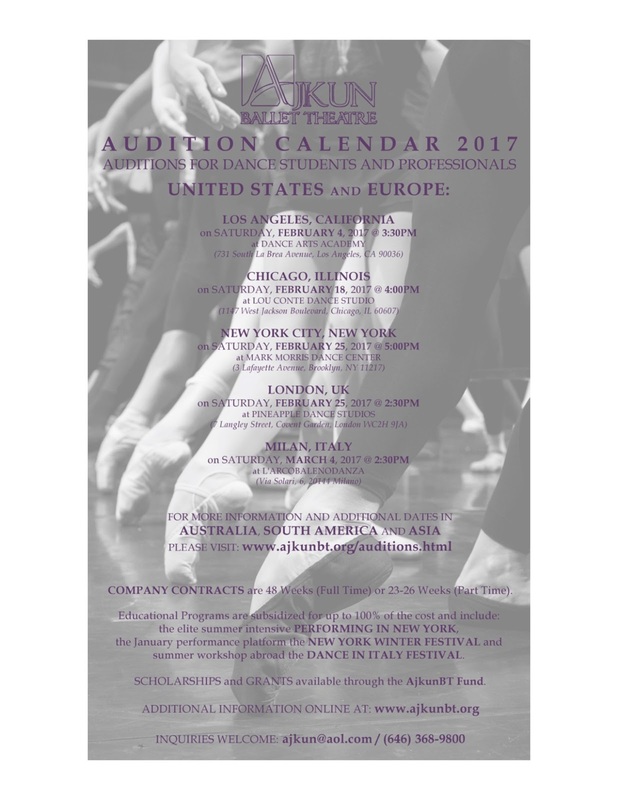 Requirements: minimum age 14 years, (there is no maximum age for dance teachers), strong background in ballet or Modern/contemporary Dance. The 2017 edition runs July 22 – August 19. Requirements: minimum age 16 years, maximum age 35 years, background in ballet must include partnering skills and good knowledge of traditional repertory, additional background in contemporary dance a plus, but not necessary. Annual contract: 48 weeks, of which 12 on tour. 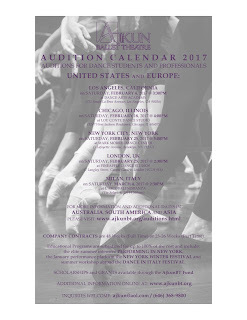 Requirements: minimum age 16 years, maximum age 23 years, background in ballet must include strong pointe skills (females, only), additional background in contemporary dance a plus, but not necessary. The Fund grants US$130,000 per fiscal year to dancers and US$100,000 to choreographers. Currently are open applications to candidatures for the fiscal years 2018-2019-2020. Audition Applications must include the audition form and all items listed on the form. Email artisticstaff@ajkunbt.org or visit our website to obtain the form. Auditions by DVD are welcome. Please visit www.ajkunbt.org | navigate the website by clicking the links. AJKUNBT AUDITION MAIN accessible at www.ajkunbt.org.